Programming note: Jessica bowed out this week . We assume it’s because she lost herself in a world of sunny beaches and oceanfront tranquility. Noel: Two interesting stories bring an end to our spooky roundtable on this month (which has been delightful, I think). 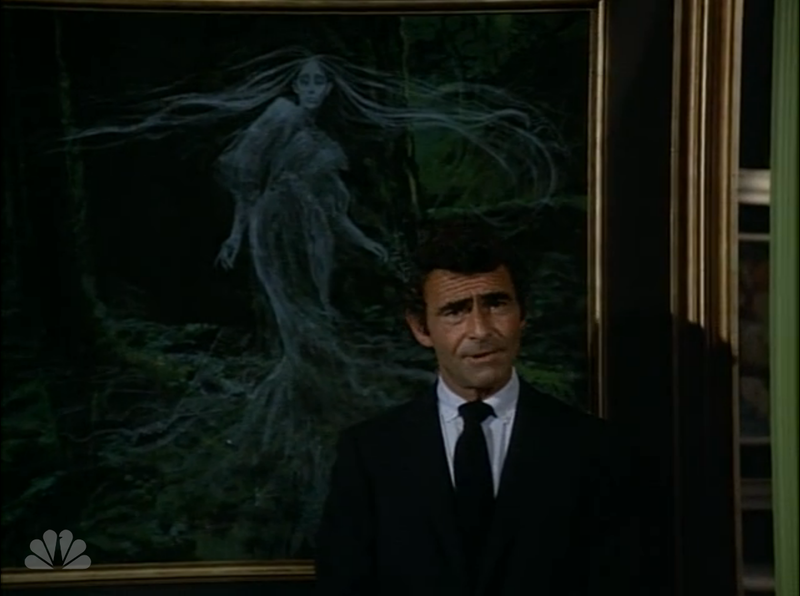 Rod Serling’s Night Gallery, the NBC follow-up to The Twilight Zone, has a similar format to it predecessor, with Serling as a host introducing stories of the horrific and fantastic. Here, we have a story of werewolves terrorizing the grounds near a sanatorium and then a story about a boy who slowly withdraws into a world of snow. “Silent Snow, Secret Snow” is, for me, the more interesting of the two. 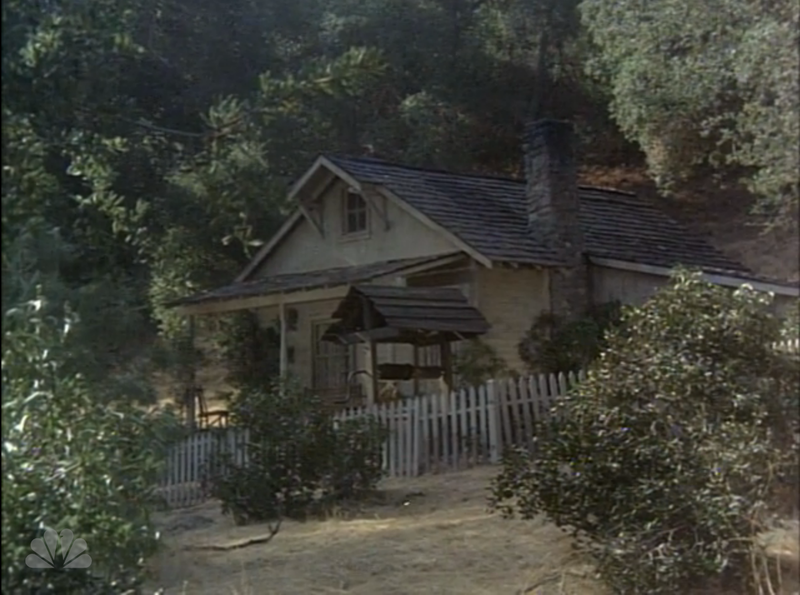 “The Phantom Farmhouse” is too neat, too dull. Even if David McCallum (Ducky from NCIS!!) and Linda Marsh are both oddly captivating as a couple despite their limited screen time, the segment just doesn’t go anywhere interesting to me. It even has stereotypical, superstitious European “peasants” nearby who insist on McCallum’s character taking a pure silver crucifix for safety. There’s not even much horror in it, really, save for McCallum’s “fight” with the wolves. But “Silent Snow, Secret Snow” is completely captivating. Part of this, of course, is Orson Welles’ melodious narration, but there’s just a range of avenues in working through this short story. Is Paul going deaf, as was my first thought? No. Is he being possessed by some sort of demon? No. He is instead just steadily retreating from the natural world. But why? Is he sick of corruption? Snow is one of those symbols of cleanliness and purity, so is he retreating to a world that is clean? Is that what drives him to declare that he hates his mother? What did you all think? J.: For me, it feels like what Paul is looking for is tranquility and peace, not so much cleanliness and purity. He first experiences the snow when it muffles the loud footsteps of the mailman; he later envisions it softening all the noises around him. I think he’s retreating from a hostile, noisy world he doesn’t understand. Of course, the narration puts a kink in that interpretation, since the snow seems to have an actual voice, like some sort of meteorological Tyler Durden. It may be tranquil, but Welles’s voice gives it the lure of a icy predator. Oh, and what of the scene where he returns home and sees himself in the window above? Is that symbolic of him splitting from his old life? Man, it makes my head spin. The easy answer is that Paul is having a genuine mental breakdown—that he’s schizophrenic, and the snow and the voice are just the onset of hallucinations and a separation from reality. But that’s too simple; it’s far more compelling for me to think that he’s retreating from an angry world of mocking classmates, overbearing teachers, and clueless parents. But, in addition to all of that, I thought that “Silent Snow” was really, really creepy, far more so than anything we’ve watched so far. The tight, intrusive camera angles and nonlinear editing gave the entire piece a detached, off-kilter feel that wouldn’t feel out of place in a David Lynch movie. Add to that the gorgeous narration—which I assume is text from the short story, which I’ve never read, but Welles transforms into something extraordinary. Andy: David Carradine’s character in “The Phantom Farmhouse” definitely knows where the fish lives, J.
I had initially thought “Farmhouse” was going to turn into a weird psychological exercise—the beginning, with a diverse group of people gathered on a series of asymmetric perches, had me expecting to find out they were all some sort of Jungian manifestations of one person’s psyche. The windy pacing, mannered performances, and unexplained creepy details (Gideon smashing the guitar, the old woman’s stained hands) gave the story an initial tinge of the surreal. But then it settled into a conventional werewolf story, the pacing became more plodding than interesting, and I was just running out the clock. By itself that’s not much more than a sign of Joel’s retrograde attitude. But then Betty, the young woman in his therapy group, is murdered by wolves after being delivered to them by Carradine’s Gideon, who is established as a “warlock” in their service. He finds nummy human meals and serves them up to Mildred and her kin—he’s the Silver Surfer to Mildred’s Galactus, basically—and then he calmly admits all this to Joel in a matter-of-fact conversation devoid of anything like grief, anger, horror, or regret on either of their parts. Gideon explains that he didn’t like Betty because she was “a snoop” and “too good”—and he also implies that he bedded her before succumbing to this dislike. Betty was tolerable as a sexual partner, but she made him feel inferior, so she had to be dispatched by the clearly-coded-as-virginal Mildred. Making this even ickier is that Betty is killed in the same meadow where, just a couple scenes before, the bodies of slaughtered sheep were found. The connection between the woman and the service animals is blatant. Again, I’m not sure if “The Phantom Farmhouse” is trying to comment on the sexual insecurity eating away at these archetypes of supposedly enlightened 1970s masculinity—Joel, the cultured intellectual; Gideon, the sensitive, guitar-strumming bohemian—and demonstrating how their Madonna desires are ultimately both corrosive and unreal. If it is, this becomes a more engaging piece of horror parable, if not a more effectively executed one. If it’s not, well, then it’s just as ugly as it is dull. As to the stories themselves, “The Phantom Farmhouse” was definitely a weak installment. 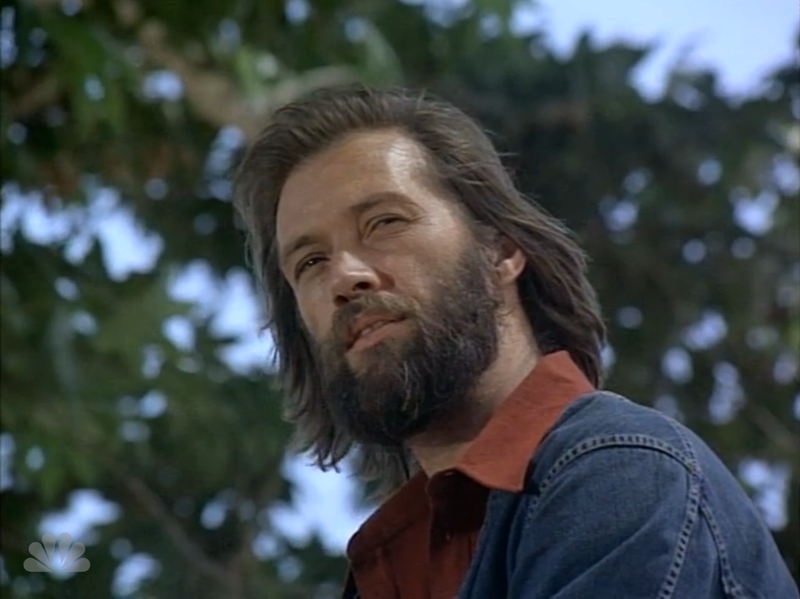 It’s always a pleasure to see David Carradine in anything, and I particularly enjoyed his disconnected performance as a recovering addict who may or may not be communing with otherworldly forces, prone to acting out by smashing his guitar and breaking conversations to offer a game of croquet instead. But otherwise there’s definitely not much holding it together—the relationship between Joel and Mildred came across as forced to me, the story dragged and plodded along, and the ending resolution didn’t feel satisfying because they failed to make me feel invested either in the fate of Joel or the three werewolves. Andy, I certainly see the point you’re making regarding the piece as gender commentary, and I think that they did have higher aspirations but it’s just clumsily handled. Possibly due to the fact that the Seabury Quinn story they adapted for this was written in 1923, and therefore they had to update the context by several decades. I haven’t read the original story so I don’t know for certain, but the writing here definitely smacks of overshooting the mark to the point the message is either botched or missed entirely. “Silent Snow, Secret Snow” on the other hand I have read the original story of (available here courtesy of the Virginia Quarterly Review) and both story and episode are legitimately terrifying. Like “Breakdown,” this is a story that is very much internalized, but while Joseph Cotten’s character was desperately raging against the confines of his mind, Paul progressively draws deeper and deeper into them. Noel and J., you both offered your theories as to why he does, and the ambiguity of the story makes it even more fascinating and frightening because any of the above could be right. There’s no indications of his being bullied or abused, either at home or at school—he simply wants to go away without explanation, to a place where things are more muted and peaceful. For the next roundtable, we’re going to once again take a thematic approach, looking at multiple shows inside a single genre. This time, our focus is on some of the great detective dramas, looking at their approach to both solving crimes and the dynamic of the detectives in question. We’ve opted for a mix of portrayals, from the lone sleuth to the mixed-gender partnership. And fittingly, our squad room has been restaffed for the discussion, as Les, Andy and Jessica are joined by new members. Cory Barker rejoins us after a month off and we welcome Sabienna Bowman, Kerensa Cadenas and Cameron White for their first discussions. As there’s a lot of us, we’ll be rotating coverage of the shows, which should hopefully provide a nice variety in the discussion. 11/22: Off for Thanksgiving. Please eat turkey and discuss your favorite holiday specials until we return. I like “Farmhouse” because of its acting and quiet, elegiac style. 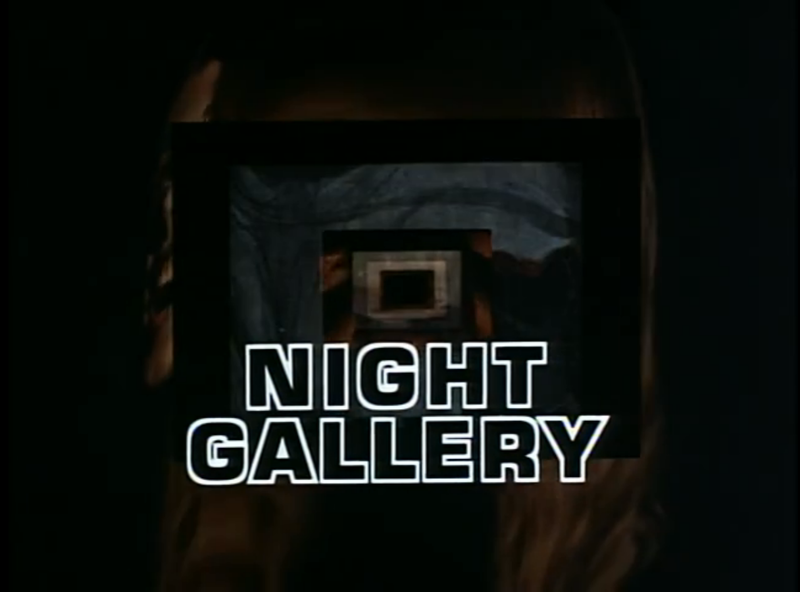 Your pieces rarely reference writers or directors, which I think is odd, but Jeannot Szwarc, who directed this, was perhaps NIGHT GALLERY’s finest director, and he does a really nice job on “Farmhouse.” Can you imagine the networks putting something this poetic on the air today? Which brings me to “Silent Snow, Secret Snow,” which, yeah, is brilliant. Gene Kearney adapted and directed it. Again, no network would put something like this on the air today. And some critics say we’re in a “Golden Age of Television.” Pishtosh. BTW, McCallum (Ducky??!!) was once one of the biggest TV stars in the world, playing Illya Kuryakin on THE MAN FROM U.N.C.L.E. That is an odd omission, but I think a lot of that centers from most of us watching these for the first time, so we’re engaging the episode very specifically. Going off what Noel said, I think we do mention writers and directors, but we usually tend to mention them only when it’s a director people know. For instance, we pointed out that Hitchcock directed “Breakdown,” or going back to Taxi we made a point of discussing Jim Burrows. You think James Burrows is more “famous” than Jeannot Szwarc? Well, maybe (both men are still very busy TV directors, but Szwarc’s career goes back even farther), but you could probably slide a comic book and two cigarette papers between that gap. Anyway, I think it’s next to impossible to discuss any film or television without talking about the people who actually, you know, made it. Or maybe that’s just me. 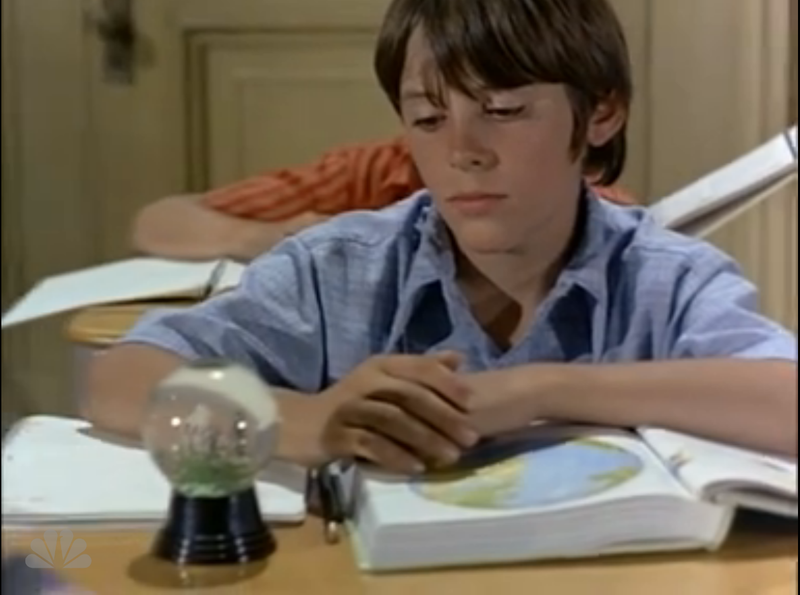 I’m still adjusting to daily reading a blog about television written by people who don’t seem to know very much about it (but I’m trying to learn). James Burrows is 100 percent, categorically, completely more famous than Jeannot Swarc. Burrows might be the most famous TV director of all-time. I appreciate you pushing through the difficulties each day though! No, Marty, I don’t think it’s just you. There’s value in that approach, absolutely, and it’s not being addressed very much here. It’s certainly something to improve upon. That being said, there’s very little need for the snideness in that last paragraph (and I’m biting back my own snideness in response, I must admit). We all have different frames of references, and part of this project is an attempt to expand that frame by engaging in older and different sorts of television programming. Much of this is being done in a self-contained, episodic way, and while that is limiting in a number of cases, we’re engaged in a self-guided learning process, and it’s very far from perfect. You know, you’re right as I read back what I wrote. That didn’t come out exactly as it was supposed to. The point I was trying (poorly) to make is that you guys seem to know very little about the history of the medium (due to age, I suppose, but syndicated reruns have been around forever and shows on DVD for over a decade), and no other TV blog I read is produced by people who don’t know, for instance, what THE MAN FROM U.N.C.L.E. is or are watching brilliant stuff like TAXI and NIGHT GALLERY and saying, “Hmm. Never saw this before.” It’s more like, as someone who has been a television buff since junior high school, I’m trying (not well so far) to understand where you guys are coming from. I believe that it’s very very difficult, if not impossible, to discuss contemporary television without an understanding of its past. I have the same problem with some of the Onion AV Club writers, for instance. One of their film critics admitted once he had never seen a Burt Reynolds movie, and I didn’t understand how anyone could write intelligently about films without knowing what Burt Reynolds–not an obscure star by any means–was all about. James Burrows the most famous TV director ever? I doubt one of 100 people on the street could tell you who he is. I doubt 10 of 100 casual TV fans could tell you. The most famous is probably somebody like John Frankenheimer or Lumet or Pollack or Altman or Peckinpah or even Spielberg. Really, there is no such thing as a “famous” television director, if you’re limiting that to filmmakers who worked exclusively (or almost) in television–both Szwarc and Burrows dabbled in features; Szwarc more successfully. There have been many terrific television directors, however–Roley, Pevney, Hoblit, Horn, just pulling some names off the top of my head. One reason I keep coming back to this blog is for its alternate point of view, even if it does leave me shaking my head sometimes (“oh, these kids today”). I am very happy you guys are discovering “new” shows, because–as with film–there is so much about TV’s past to admire and enjoy that is, unfortunately, ignored or scorned by contemporary critics (quite wrongly, I think). Anyone who believes we’re currently experiencing a “Golden Age of Television” doesn’t know much about the past, I think, and I’m looking forward to you guys discovering that. Well, everyone is entitled to his or her opinion. Mine is that the QUALITY of James Burrows’ television shows are far and away superior to those of Mr. Szwarc. I must confess however, that The Practice and The Rockford Files are among my guilty pleasures. No reason to feel guilty about those shows. THE PRACTICE, for its first few seasons, was often a brilliant legal drama that didn’t shy away from tackling important issues. It eventually turned into a ludicrous comic book–and even many of those episodes were loopy entertainment (like the Larroquette shows)–and I had stopped watching long before it changed format its last year. THE ROCKFORD FILES, meanwhile, is quite likely the greatest private-eye series of all time, though if you wanted to argue in favor of HARRY O or MANNIX, I wouldn’t put up a huge fight.